If you are looking for an awning to shade your deck, patio, porch, windows or doorways, Canvas Specialties has the shading solution for you! Our residential awnings come with a 10 year warranty and are made with only first quality material from retailers such as Sunbrella and Sattler. Galvanized inside and out, our awning frames are made of gator shield. Frames can be bent or formed to any shape your deck or patio space requires. 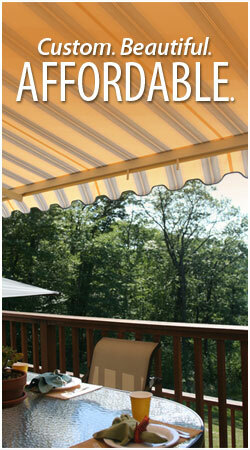 Stationary and patio awnings can be mounted on roof edges and under soffets or flush mounted to your home. The same can be done for any of the other residential products we offer. Schedule a FREE On-Site Consultation or call us at (888) 870-8207 today!